I've noticed that for the inspection warning,Error,Info, etc. 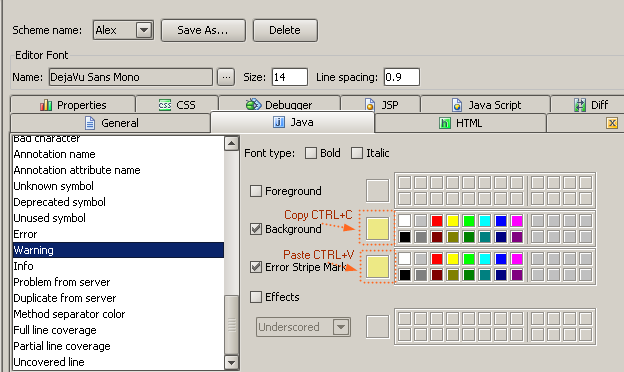 colors, you usually want the error stripe mark to be the same color as the foreground/background/effect in the editor. Also, sometimes I wan to use a color from another style as a base. Currently, I haven't found a way to copy/duplicate existing colors. What I was thinking is that you should be able to click on the color patches and press CTRLC to copy the color and then click on another patch and press CTRLV to paste the color into another color patch. +1 yes indeed, that would be so much better than trying to remember the RGB numbers!